The Crown Center at Laurel Lake has earned a Five-Star Rating from the Centers for Medicare & Medicaid Services (CMS), the federal agency responsible for overseeing the quality ratings of skilled nursing facilities that participate in Medicare or Medicaid. 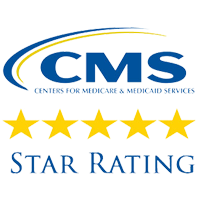 The Five-Star Quality Rating System ranks nursing facilities in order to provide consumers with an easy-to-understand assessment of nursing home quality. The rating system reviews facility performance for four performance measures: health inspections (measures based on outcomes from state health inspection surveys), staffing (measures based on staffing levels), RN staffing (measures based on RN staffing levels), and quality measures (based on the CMS Minimum Data Set that records outcomes of care). The Crown Center received a five out of five star rating overall, placing it in the top 10 percent of the best nursing facilities in Ohio and the nation. Located in the heart of Laurel Lake’s 150-acre campus, the 75-bed Crown Center skilled nursing facility offers personalized and compassionate short term rehab and long term care, both to Laurel Lake residents and to direct admissions from the Northeast Ohio community. Its highly rated Ansley Therapy Center offers inpatient and outpatient rehabilitative therapy. The Crown Center is Medicare-approved. For information about Crown Center admission or outpatient services through the Ansley Therapy Center, call 330-655-1451.